Police officers are working to determine what caused 26-year-old Shannan Carrier’s 2006 Nissan Altima to veer over the center line in the 400 block of Route 112 near Thibodeau’s Dairy at 11:40 a.m. on Wednesday, October 21st. Carrier was ejected from the vehicle and died upon impact after her car struck a 2008 Honda Ridgeline pickup truck driven by 48-year-old Thomas Lavin of Standish. He was taken to Maine Medical Center and treated for injuries. At this point, his condition is unknown, but Saco police say the crash was so violent, it literally split the woman’s vehicle in two. Both drivers were wearing seatbelts at the time. The road remained closed until at least 5 p.m. as investigators reconstructed the scene and tried to piece together what may have happened. Sometimes manufacturers can be held liable if the vehicle’s brakes, accelerator, tires or other technical components fail to function properly at the time of the crash. If intoxication played a role, the person serving the alcohol may be held liable under certain circumstances. In some states, individuals knowingly calling or texting a driver have been brought into court for their roles in distracted driving cases. Is the road to blame? 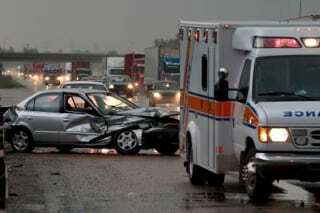 Not all car accident cases are a simple matter of driver liability or negligence. According to CBS13 News, people living in the vicinity say that accidents happen all too frequently on this stretch of road because people drive too fast. “I can’t speak for this particular accident, but people need to pay attention, there are curves in the road,” said area resident Rick Grant. “Stronger police presence would probably help slow them down,” added fellow resident, Robert Taylor. The National Highway Traffic Safety Administration (NHTSA) published a summary of investigations from 2.2 million traffic crashes on U.S. roadways and determined that “environmental factors” played a role in 52,000 accidents. Federal, state and local governments and their hired contractors have a duty to the general public to safely design, construct and maintain highways and roads in their jurisdictions. When they fail to do so and a serious accident occurs, they may be held liable for injuries and fatalities. Sometimes the speed limit for a particular area is too high and further action is warranted to prevent future incidents. To determine liability, experienced Maine car accident lawyers may use pictures of the scene taken immediately after the collision, weather reports, blueprints of the road design, government records of maintenance schedules, filed complaints, past lawsuits or accident reports related to the roadway, road construction plans, and various measurements (such as the length of a guardrail, the distance between warning signs and hazards, the width or a lane, or the degree of a curve or slope). Eyewitnesses, as well as expert witnesses on road design, may be called in to testify and add credibility to the hypothesis of what happened and which parties were at fault. Determining fault in car accidents can be a complex investigation, which is why so many questions remain unanswered after this recent crash in Saco. Is your head still reeling from a recent car accident involving yourself or a loved one? Call the law firm of Hardy, Wolf and Downing for a free consultation to see if you have cause for litigation.